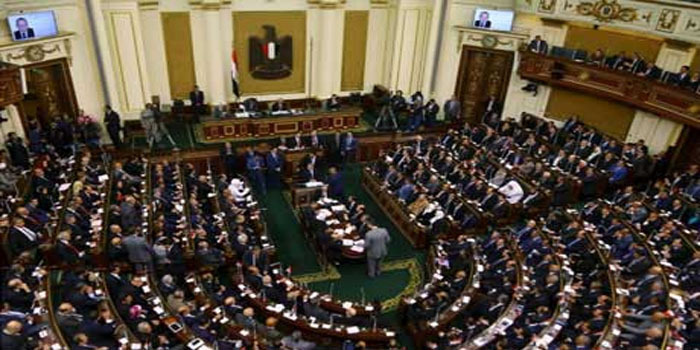 Egypt’s parliament, the House of Representatives, will hold a plenary session on Tuesday to take a final vote on proposed amendments to Egypt’s 2014 constitution. Parliament speaker Ali Abdel-Aal told MPs on Monday that they should be present as early as 10am. Ahram Online has obtained a copy of the final drafts of the proposed constitutional amendments, which aim to change 14 articles as well as introduce two new articles to Egypt’s 2014 constitution. The following is a list of the 14 constitutional amendments proposed by the Support Egypt parliamentary majority bloc and the two new articles on the post of the vice president and the upper house of parliament. (1) Article 102 (first paragraph): The change aims to reduce the number of elected MPs in the House of Representatives (Egypt’s lower house of parliament) from 596 to 450 MPs, with at least 25 percent of the seats (112 seats) to be reserved for women representatives. (2) Article 102 (third paragraph): The law regulating the performance and election of the House of Representatives is to be changed to go in line with the above article. The law should observe the equitable distribution of population and governorates, and allows for either the individual candidacy or the party list, or a mix of the two, to be adopted. (3) Article 140 (first paragraph): The president of the republic shall be elected for six (instead of four) years, beginning on the day after the end of his predecessor’s term, and he/she cannot remain in office for more than two consecutive terms. (4) Article 241: The term of the sitting president (Abdel-Fattah El-Sisi) will end following the date of declaring him an elected president of the republic, and he can be re-elected for another six-year term. (5) Article 160 (first paragraph): If a temporary obstacle makes the elected president unable to perform his duties, he will be replaced by a vice president or prime minister if there is no vice president. (6) Article 160 (last paragraph): If a caretaker president takes office, he shall not be entitled to amend the constitution, dissolve the House of Representatives or Senate, or dismiss the government. The caretaker president will also not be allowed to run for president. (7) Article 185: Each individual judicial authority shall take charge of running its own affairs, and it will be consulted on laws regulating its own business. The president of the republic shall appoint the heads of judicial authorities from among five who will be nominated by its higher councils, and their term of office will be four years. A higher council for judicial authorities will be created and the president of the republic will be its head. The council will take charge of discussing the affairs of judicial authorities. In case of the president’s absence, a head of a judicial authority will be delegated by the president to consider the conditions of appointing members of judicial authorities and their promotion, and he will be consulted on laws regulating their business. Judicial authorities will also have their own independent budget. A law to be issued to regulate the roles of the Higher Council for Judicial Authorities and its decisions are to be taken by consensus of its members. (9) Article 189 (second paragraph): A prosecutor-general, who will be the head of the prosecution-general authority, will be named by the president of the republic from among three candidates to be nominated by the Higher Council for Judicial Authorities. The prosecutor general’s term in office will be four years. (8) Article 190: The State Council will be exclusively authorised with settling administrative disputes, disciplinary cases and appeals, and revising draft laws and decrees. A law in this respect shall be issued to describe the roles of the State Council in detail. (9) Article 193 (third paragraph): The head of the Supreme Constitutional Court will be named by the president of the republic from among the court’s most senior deputy heads. The panel of the court’s commissioners will be also named by the president only upon a recommendation from the court’s chairman and after taking the opinion of the court’s general assembly, and in line with the law regulating this matter. (10) Article 200 (first paragraph): The Armed Forces is the people’s arm, and its job is to protect the country, safeguard its security and the integrity of its land, preserve the constitution and democracy, maintain the basic pillars of the state and its civilian nature, and uphold the gains of the people, and the rights and freedoms of individuals. The state will be exclusively authorised to create such forces, and any other individuals, authorities, or groups will be banned from forming military or semi-military organisations and militias. (11) Article 204 (second paragraph): Civilians can face trial before military courts only in cases of assaulting military establishments, military camps, military zones and borders, military equipment, vehicles, weapons, ammunition, documents, secrets, funds, or army factories. Trials can also cover crimes related to recruitment and drafting, and assaulting officers and personnel affiliated with the Armed Forces while they are performing their duties. (12) Article 234: The minister of defence will be named upon the approval of the Supreme Council of Armed Forces. (13) Article 243: The state shall guarantee that workers and farmers are adequately represented and in line with the law regulating this respect. (14) Article 244: The state shall guarantee that youth, Christians, the physically challenged, and Egyptians abroad, are fairly represented in line with the law regulating this matter. The president of the republic shall be authorised to name one or more vice president, specify his/her roles, dismiss them from their post, and accept their resignation. The constitution’s articles 141, 144, 145, 148, and 173 will govern this matter. The Senate shall be responsible for studying and proposing all that is necessary to uphold the principles of the two revolutions of 25 January and 30 June, support national unity and social peace; maintain the basic pillars of society, its higher values, rights, freedoms, and general duties; and take charge of deepening the democratic system and broadening its scope. The Senate will be consulted on proposed amendments to the constitution; laws stipulated by the constitution; five-year socio-economic development plans; peace and alliance and sovereignty agreements; and laws and all foreign issues to be referred by the president and related to the state’s general policies and its foreign and Arab relations. The Senate shall comprise 180 members, and its term will be five years. A third of the Senate’s members shall be elected in a secret ballot, and a third will be appointed by the president. A Senate member should be Egyptian, not less than 35 years old, have a university degree and legally allowed to exercise his/her civilian and political rights. The election of the members of the Senate will be governed by the law in this respect. The individual candidacy or the list system, or a mix of the two, can be used in electing the Senate’s members. A Senate member cannot be a member of the House of Representatives at the same time. The prime minister, his deputies, cabinet ministers and other government members have no responsibility before the Senate. Workers who served with the defunct pre-2013 Shura Council will be used to serve and operate the Senate.